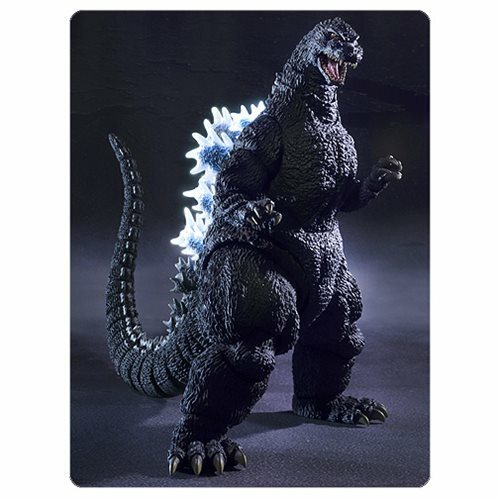 Shopping for Godzilla Action Figures? The first release in the SH MonsterArts Kou Kyou Kyoku series. It's an all new approach to action figures, with superb posability, light (KOU), sound (KYOU), and music (KYOKU)! LEDs illuminate Godzilla's mouth and fins. And a sound chip replicates three different roars, his radioactive breath, and the sound of his thundering footsteps. And that's not all. It also includes two music selections: "Godzilla's Theme," and "Godzilla vs. the Tanks." Figure stands nearly 8-inches tall! Requires 3x "LR44" batteries, not included. Ages 15 and up.